The smell of orange blossoms infuses the backyard and brings memories of our home in Northern Iran. Inside the home, there's a rush to finish up the khune tekooni (Pre-Persian New Year spring cleaning). There are wheat and lentil sprouts by the window growing few millimeters each day until they are ready for the haft seen. If we were in Iran, the streets would've been crowded by people doing their last minute Nowruz shopping, like how crowded it gets prior to Christmas here in the US. But for us, we create the buzz in our little home by making sure that we still keep certain traditions, like painting the eggs, or slaving in the kitchen to make our own samanoo and Persian pastries such as ghottab. 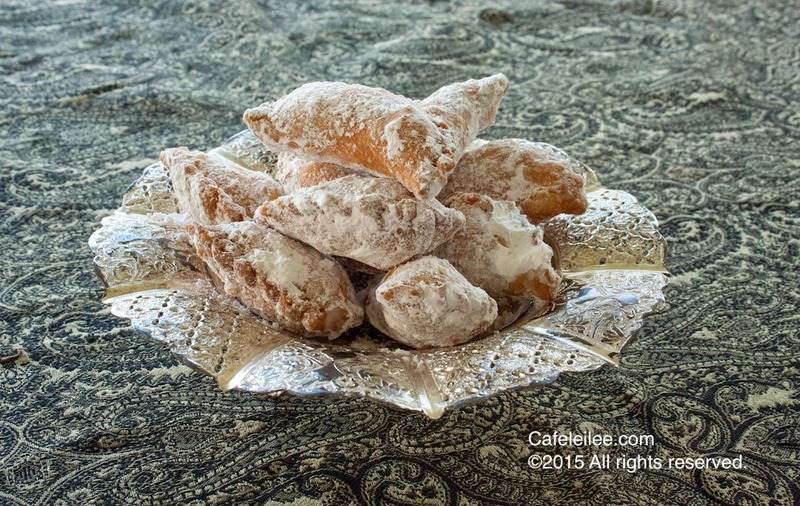 Like many other Persian sweets, ghottab is a sweet infused with rose water and cardamon. 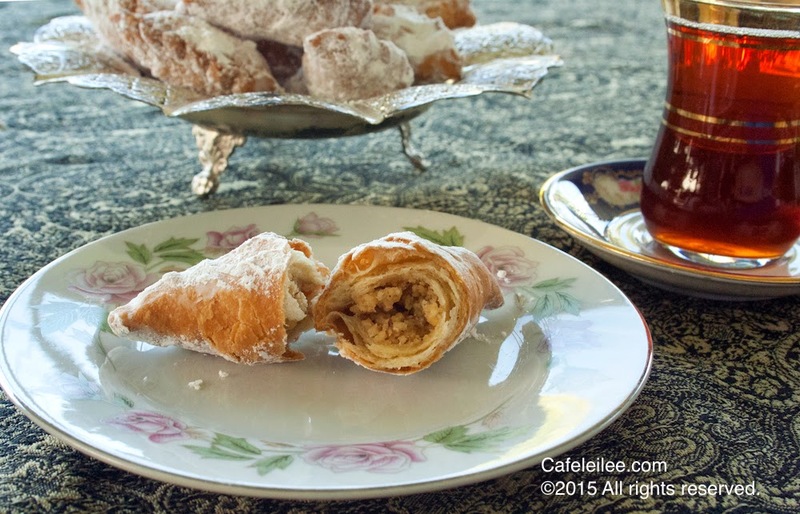 Its walnut filling showcases the delicious Iranian walnuts and makes for a perfect accompaniment to the afternoon tea. As Nowruz is approaching, I wish you a sweet year ahead filled with love, happiness, and prosperity. This recipe was given to me by my sweet aunt Gohar. In a small bowl mix in the dry yeast with 1/2 cup of lukewarm water and set it aside. In a separate small bowl mix in the wheat starch in with the rosewater and set it aside. In a large bowl mix in the flour with egg yolks and melted shortening and break the flour with your fingertips. Mix in the yeast and starch, yogurt and rosewater mixture and knead the dough until a ball forms. If the dough is sticky add some flour if it's dry add in some rosewater. Place the dough in a bowl and cover with a towel for about 30 minutes. Meanwhile, in a food processor ground up the walnuts and turn it into a bowl. Mix in 1 cup of the powdered sugar and cardamom. Roll out the dough on a lightly floured surface and using a 3 inch circle cutter, cut out the dough. Place about 1 tablespoon of the walnut mixture in the center of the dough and fold the dough over so you get a half circle. Pinch the edges and twist the edges to ensure the filling is sealed in. Repeat with the remaining dough and walnut mixture. In a large pot over medium high heat, heat the oil and fry the pastries in the oil for about 5 to 10 minutes until they are golden brown. Transfer the cookies to a paper towel lined sheet and let them cool. Right before serving, roll the pastries in the remaining powdered sugar and enjoy with some hot tea. What beautiful flaky ghottab, and the silver dish it is being served in. Lovely presentation. It sure looks delectable. Happy Nowruz to you and yours! This looks like heaven! What a great dessert, I've never had it before. I have to try this. I love ghottab and yours look heavenly! So beautiful. Thank you for sharing, Leilee joon. Happy New Year!